The Clementine Ultraviolet/Visible (UVVIS) Version 2 mosaic is a grayscale data set representing the albedo (brightness of the lunar surface) as measured at the 750 nanometer (nm) wavelength by the UVVIS camera (Lee 2009). 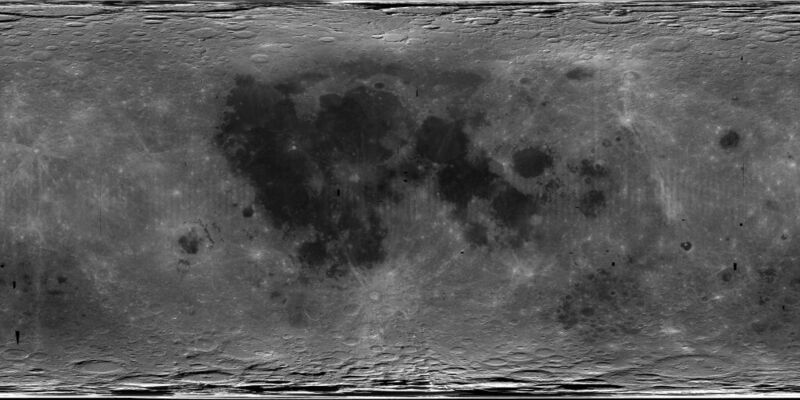 In late 2008, a revised 750nm mosaic (v. 2.0) was created at USGS to refine the locations of component images by using the latest geodetic control and projecting onto a topographic model of the lunar surface (Archinal 2006). The base map was radiometrically and geometrically controlled, photometrically modeled global image mosaic compiled using more than 43,000 images from the 750nm filter observations. Because of recent improvements in the geodetic control network of the Moon (Archinal 2006) and the availability of a detailed 3D shape model on which to project the images, we created this new controlled Clementine basemap. This product supercedes the original base map created in 1998, and also the warped product generated to reflect the shift from the original control point positions to the new positions in the 2005 control network. The few gaps in the global mosaic were filled with images taken at 900nm or 950nm wavelengths. The new Clementine mosaic corrects many of the problems identified in the earlier basemap mosaic. Procedures and processing scripts are now in place that will allow us to easily regenerate the mosaic when a new global geodetic control solution is available. Approximately 43, 000 Clementine frames were radiometrically calibrated, photometrically corrected, geodetically controlled, and projected onto a spherical shape model of the Moon  to create a global mosaic at a uniform 100 m/pixel resolution. The USGS Integrated Software for Imagers and Spectrometers (ISIS) software was used to process the Clementine data for the basemap mosaic. The ingestion, radiometric calibration, and merging of low and high exposure image pairs were performed using the program ‘uv-viscal’ in the earlier ISIS 2 software. The analysis of the control network, repair or removal of bad control points in the network, updating of the camera pointing information to correct obvious offsets between images, and creation of the tone-matched mosaic was performed using the newest ISIS 3 software. The images were then photometrically corrected (using the Lunar Lambert photometric model and the ‘Moon Albedo’ normalization model) and trimmed in ISIS 3. The method used to convert from a 32bit to a 8bit image was to linearly stretch the data range from (0.048, 0.5) down to (1, 255) leaving 0 for NODATA. This resulted in some value saturation especially at the poles.